Following a clear run in the taxi to Heathrow Terminal 4, I met Phil in the First Check In area, and we went to collect our boarding passes from the desk. As always, we‚Äôd checked in 24 hours before hand online, and had secured the best seats in First (1A and 1K). We spotted our first celebrity of the trip here at the First check in; John Hannah. As we joined the Fast Track security queue, we noticed that our Gold status wasn‚Äôt showing on our boarding passes. This was quite annoying because it meant that the crew‚Äôs manifest wouldn‚Äôt show our status and CIV scores (a number between 1 and 100 that indicates how commercially important BA think their frequent fliers are). Once through security, we took a right and made our way to the Concorde Room. 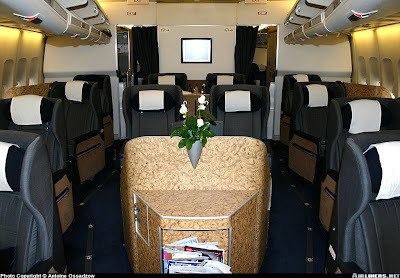 Now that the days of Concorde are behind us (sob) the lounge now functions as a BA First Class Only lounge. As we went in, we asked the lounge dragons if they could put our cards back on the booking, but unfortunately it seems that BA‚Äôs new practice is to remove them from non-commercial tickets. We did try another couple of times at the Business and First lounge desks, but to no avail. In the end, we admitted defeat, and settled down to some bacon baguettes. 3 glasses of Tattinger later our flight showed as boarding, so we headed to our gate. When we reached the plane door, one of the crew members looked at our boarding passes and said ‚ÄúCome with me please, sir‚Äù as he lead us to our seats in the pointy part of the plane; 1A and 1K. We took our seats, and were happy to accept the Purser‚Äôs offer of a glass of champagne. Over the last year, we‚Äôve watched the quality of the champagne in the First and Club cabins deteriorate ‚Äì and when you‚Äôre generally paying over ¬£5,000 for a return ticket, the cut backs seem a bit of a cheek. So we were very pleased when we watched our first glass of Perrier Jou√´t Belle Epoque being poured. If this champagne becomes the new standard, it will be no bad thing. 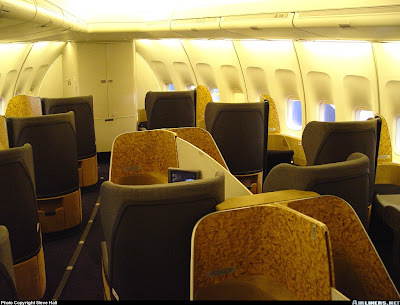 The First cabin was very full for this flight ‚Äì with only 1 of the 14 seats unoccupied. This is generally a warning that the cabin crew are going to be busy and have less time for the one-to-one service experienced on lighter loads. This couldn‚Äôt have been more wrong. As is often the case, the Cabin Services Director (CSD) came to welcome us onto the flight. But it didn‚Äôt stop here ‚Äì he stayed and chatted between our two seats for a good 10 minutes before moving on. He was interested in where we were going (although as usual we didn‚Äôt go into too much detail about how insane the trip was). The rest of the crew in our cabin were also very friendly, and chatted to us about where we were going, interested in what we did for a living given how much we flew. One of them also mentioned that ‚Äúone of the bosses‚Äù was on board, which turned out to be one of BA‚Äôs Directors and his family. I settled down to watch a film. This plane hadn‚Äôt yet received the upgraded Video-on-demand, so we when lunch was served, it meant missing parts of the film. With the new service you can pause and rewind films in the way you would with a DVD. There were a few new touches since our last flights in First in November ‚Äì the wash bags have been re-done with new products, the pyjamas are slightly different and slippers are also provided (although there were none on our flight as it was not overnight). For lunch I chose a Feta Cheese and Mediterranean Tart for my starter, and Rack of Lamb for my main. I continued with champagne with the starter, and then moved onto a fabulous 1er Grand Cru Bordeaux with the Lamb. Between the films we had more chats with the crew, each of them extremely friendly and never giving the feeling that they had to get back to what they were doing. At one point I nipped back to the galley to steal a glimpse of the flight manifest to see if our status and CIV scores were showing. Unfortunately they were absent, as predicted following the missing status on our boarding passes. Still – given the excellent service we had throughout the flight, it couldn‚Äôt have made any difference. During a quiet moment, I wandered back up to the galley to find the Purser. We had a quick chat, and I thanked him for such excellent service on the flight. He was very grateful, and even said we were ‚Äúthe ideal passengers‚Äù, which I took to mean that we enjoyed ourselves and didn‚Äôt give the crew any crap. By the time we landed, we‚Äôd made up 40 minutes of our delay. We‚Äôd both worked our way through most of the champagne reserves, and were looking forward to getting to our hotel. The queue for arrivals moved quite swiftly, although the immigration officer gave me a bit of a grilling about my passport. Having a lot of stamps from the Middle East didn‚Äôt help, and the questions were all along the lines of ‚ÄúWhy are you here?‚Äù, ‚ÄúWhat were you doing in Bahrain?‚Äù, ‚ÄúAnd in Doha?‚Äù (to which the answer to all of those was the same; ‚Äúon a jolly‚Äù). After 5 minutes of scrutiny, raised eyebrows, and no hint of a smile, I was allowed to enter the land of the free. A $25 cab fare saw us to the hotel front door, and I walked up to the Ambassador desk to check in. The lady was very kind, and showed me up to my room, which had been upgraded from a cheap-as-chips King bed room to a Harbour View Junior Suite. The hotel had undergone a complete refurbishment only re-opening a few weeks before hand, and it showed. The harbour view wasn‚Äôt much to look at, but the suite itself was lovely. It had a very long open planned feel, with a bed at one end and the lounge at the other. Behind the bedroom was a very nice bathroom. Above the substantial bath was a large opening which looked down the entire length of the suite (with frosted glass panels that could be pulled across). We were pretty shattered after a long day, so we just spent the evening watching a film and emptying the mini bar (both compliments of my Royal Ambassador status). We also polished off the bottle of Belle Epoque from our flight, since we wouldn‚Äôt be allowed to take it in our hand luggage the following day. We weren‚Äôt too worried about heading out into Boston as we would be staying again for a couple of nights on the return journey.